Have you ever wondered or been questioned about why despite practicing meditation, reading and contemplating wisdom teachings regularly, we sometimes don't seem to make any progress? An old farmer lived in the mountains with his young grandson. Each morning Grandpa woke up early to meditate, read and contemplate wisdom teachings. His grandson loved and respected him, wanted to be just like him and tried to imitate him in every way he could. One day the grandson asked, "Grandpa! I also try to meditate and read wisdom teachings like you but my mind always wanders, I don't understand much, and whatever I do understand I forget soon after. What good does meditation, reading and contemplating really do?" The Grandfather smiled, quietly turned from putting coal in the stove and replied, "To understand this, I would like you to take this coal basket down to the stream outside and bring me back a basket of water." The boy did as he was told, but as it was a wicker basket, all the water leaked out before he got back to the house. 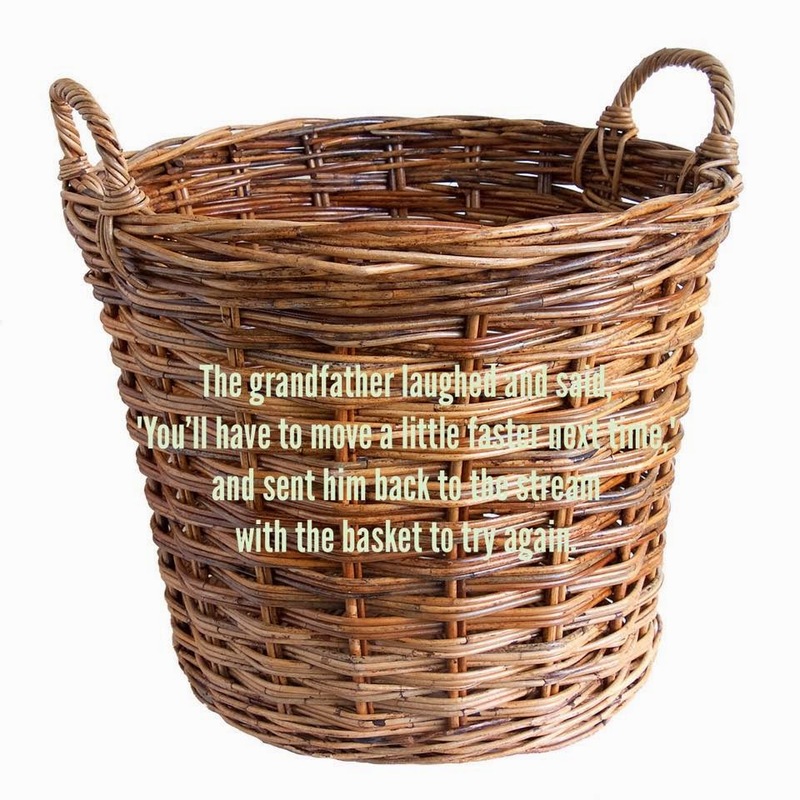 The grandfather laughed and said, "You'll have to move a little faster next time," and sent him back to the stream with the basket to try again. This time the boy ran faster, but again the basket was empty before he returned home. Out of breath, he told his grandfather that it was impossible to carry water in such a basket, and he suggested they should use a bucket instead. The old man said, "I don't want a bucket of water; I want a basket of water. You're just not trying hard enough," and this time he came to the door to watch the boy try again. By this time, the boy knew it was not possible, but he wanted to prove to his grandfather that even if he ran as fast as he could, the water would leak out before he got back to the house. The boy again dipped the basket into the stream and ran hard and fast, but by the time he reached his grandfather the basket was once again empty. Out of breath, he said, "See Grandpa, it's completely useless!" "So you think it is useless?" The old man smiled with a sparkle in his eyes, "Take a look at the basket." The boy looked at the basket and for the first time he noticed that the basket was looking different. It had been transformed from a dirty, old, discolored coal basket and was now all bright, fresh and clean, inside and out - it was looking like new again. "Son, this is what happens when you regularly meditate, read and contemplate wisdom teachings. You might not seem to be making any progress, your mind may wander, you may not understand or remember much, but still as you do so, the clear, cooling streams of wisdom, awareness and love run through you and you are changed, inside and out. This is the blessing of practicing wholeheartedly, without worries and expectations." The boy felt moved and satisfied by this remarkable example and clear explanation given by his Grandfather. All his doubts and uncertainties evaporated and were replaced by a warm and sunny confidence. Like the basket, he too felt bright, fresh and renewed. Isn't this a wonderful story? 1837- The Wonderful & Generous Husband! 1835- Why do we suffer?